The Boss at Bgo is moving fast right now. During March you will be able to enter a special competition where you can win an exclusive weekend trip for two to the Monaco Grand Prix. Not only is there a chance for you to win a trip but you can also get free spins on a popular video slot from NetEnt. We also want to tell you a little bit more about another promotion at Bgo that you can enter if you feel like it. But don’t wait too long since all of these campaigns are time limited. We’ll give you all the information you need here! In order to be able to keep an eye on your position in the competition there is a leader board at Bgo. The player with most tickets after the whole thing is over will win. Just make sure you opt-in before you start playing! For every £10 you wager with real money on slots at Bgo you will get a ticket. You can also claim up to 30 free spins per week until the 28th of March. For every ten tickets you earn you will receive 10 bonus spins. These free rounds are available on Drive: Multiplier Mayhem. 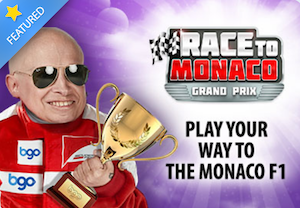 You can collect tickets until 23:59 on the 28th of March at Bgo and when it’s all said and done the player with most tickets will win a trip for two to Monaco Grand Prix including flights, as well as accommodation, transfer and tickets to the race day. Like we mentioned in the beginning there is another promotion going on at Bgo right now where you can win some serious cash prizes. This campaign will run until the 26th of March. During this period the casino will give away none the less but £500 000. For every £10 you wager on selected slots you will get one ticket to the weekly draw. But if you choose to wager £10 on a particular slot you will get two tickets instead. This week you will earn two tickets if you wager £10 on the slot Age of the Gods. The draw will take place on the 20th of March where a total of £100 000 will be handed out to lucky winners at Bgo. Next week is the fourth and last week of the campaign and during this week you will have to wager £10 on Space Invaders to get two tickets. And in this final draw Bgo will give away £200 000! Make sure you visit Bgo Casino as soon as possible.